The Invasion of Kuwait on 2 August 1990 was a two-day operation conducted by Iraq against the neighboring State of Kuwait, which resulted in the seven-month-long Iraqi occupation of the country. This invasion and Iraq's subsequent refusal to withdraw from Kuwait by a deadline mandated by the United Nations led to military intervention by a United Nations-authorized coalition of forces led by the United States. These events came to be known as the first Gulf War and resulted in the expulsion of Iraqi forces from Kuwait and the Iraqis setting 600 Kuwaiti oil wells on fire during their retreat. In early 1990 Iraq was accusing Kuwait of stealing Iraqi petroleum through slant drilling, although some Iraqi sources indicated Saddam Hussein's decision to attack Kuwait was made a few months before the actual invasion. Some feel there were several reasons for the Iraqi move, including Iraq's inability to pay the more than US$14 billion that it had borrowed to finance the Iran–Iraq War, and Kuwaiti high petroleum production levels which kept revenues down for Iraq. The invasion started on 2 August 1990, and within two days most of the Kuwait Armed Forces were either overrun by the Iraqi Republican Guard or fell back to neighbouring Saudi Arabia and Bahrain. Iraq set up a puppet government known as the "Republic of Kuwait" to rule over Kuwait and then annexed it outright, when Saddam Hussein announced a few days later that it was the 19th province of Iraq. Kuwait is annexed by Iraq. Start of the Gulf War. When the Iran–Iraq War broke out, Kuwait initially stayed neutral and also tried mediating between Iran and Iraq. In 1982, Kuwait along with other Arab states of the Persian Gulf supported Iraq in order to curb the Iranian Revolutionary government. In 1982–1983, Kuwait began sending significant financial loans to Iraq. Kuwait's large-scale economic assistance to Iraq often triggered hostile Iranian actions against Kuwait. Iran repeatedly targeted Kuwaiti oil tankers in 1984 and fired weapons at Kuwaiti security personnel stationed on Bubiyan island in 1988. During the Iran–Iraq War, Kuwait functioned as Iraq's major port once Basra was shut down by the fighting. However, after the war ended, the friendly relations between the two neighbouring Arab countries turned sour for several economic and diplomatic reasons that culminated in an Iraqi invasion of Kuwait. By the time the Iran–Iraq War ended, Iraq was not in a financial position to repay the 14 billion USD it borrowed from Kuwait to finance its war and requested that Kuwait forgive the debt. Iraq argued that the war had prevented the rise of Iranian hegemony in Kuwait. However, Kuwait's reluctance to pardon the debt strained the relationship between the two countries. In late 1989, several official meetings were held between the Kuwaiti and Iraqi leaders, but they were unable to break the deadlock between the two. In 1988 Iraq's Oil Minister, Issam al-Chalabi, stressed a further reduction in the crude oil production quota of Organization of the Petroleum Exporting Countries (OPEC) members so as to end the 1980s oil glut. Chalabi argued that higher oil prices would help Iraq increase its revenues and pay back its US$60 billion debt. However, given its large downstream petroleum industry, Kuwait was less concerned about the prices of crude oil and in 1989, Kuwait requested OPEC to increase the country's total oil production ceiling by 50% to 1.35 million bpd. Throughout much of the 1980s, Kuwait's oil production was considerably above its mandatory OPEC quota and this had prevented a further increase in crude oil prices. A lack of consensus among OPEC members undermined Iraq's efforts to end the oil glut and consequently prevented the recovery of its war-crippled economy. According to former Iraqi Foreign Minister Tariq Aziz, "every US$1 drop in the price of a barrel of oil caused a US$1 billion drop in Iraq's annual revenues triggering an acute financial crisis in Baghdad". It was estimated that between 1985 and 1989, Iraq lost US$14 billion a year due to Kuwait's oil price strategy. Kuwait's refusal to decrease its oil production was viewed by Iraq as an act of aggression against it. The increasingly tense relations between Iraq and Kuwait were further aggravated when Iraq alleged that Kuwait was slant-drilling across the international border into Iraq's Rumaila field. The dispute over Rumaila field started in 1960 when an Arab League declaration marked the Iraq–Kuwait border 2 miles north of the southernmost tip of the Rumaila field. During the Iran–Iraq War, Iraqi oil drilling operations in Rumaila declined while Kuwait's operations increased. In 1989, Iraq accused Kuwait of using "advanced drilling techniques" to exploit oil from its share of the Rumaila field. Iraq estimated that US$2.4 billion worth of Iraqi oil was "stolen" by Kuwait and demanded compensation. Kuwait dismissed the accusations as a false Iraqi ploy to justify military action against it. Several foreign firms working in the Rumaila field also dismissed Iraq's slant-drilling claims as a "smokescreen to disguise Iraq's more ambitious intentions". On 25 July 1990, only a few days before the Iraqi invasion, OPEC officials said that Kuwait and the United Arab Emirates had agreed to a proposal to limit daily oil output to 1.5 million barrels, thus potentially settling differences over oil policy between Kuwait and Iraq. At the time of the settlement, more than 100,000 Iraqi troops were deployed along the Iraq–Kuwait border, and American officials expressed little indication of decline in tensions despite the OPEC settlement. The Basra Vilayet of the Ottoman Empire in 1897. After the Anglo-Ottoman Convention of 1913, Kuwait was established as an autonomous kaza, or district, of the Ottoman Empire and a de facto protectorate of Great Britain. Many westerners believed that Iraq's invasion of Kuwait was largely motivated by its desire to take control over the latter's vast oil reserves. The Iraqi government justified its invasion by claiming that Kuwait was a natural part of Iraq carved off as a result of British imperialism. After signing the Anglo-Ottoman Convention of 1913, the United Kingdom split Kuwait from the Ottoman territories into a separate sheikhdom. The Iraqi government also argued that the Kuwaiti Emir was a highly unpopular figure among the Kuwaiti populace. By overthrowing the Emir, Iraq claimed that it granted Kuwaitis greater economic and political freedom. Kuwait had been loosely under the authority of the Ottoman vilâyet of Basra, and although its ruling dynasty, the Al Sabah family, had concluded a protectorate agreement in 1899 that assigned responsibility for its foreign affairs to Britain, it did not make any attempt to secede from the Ottoman Empire. For this reason, its borders with the rest of Basra province were never clearly defined or mutually agreed. On 25 July 1990, April Glaspie, the U.S. ambassador to Iraq, asked the Iraqi high command to explain the military preparations in progress, including the massing of Iraqi troops near the border. The American ambassador declared to her Iraqi interlocutor that Washington, "inspired by the friendship and not by confrontation, does not have an opinion" on the disagreement between Kuwait and Iraq, stating "we have no opinion on the Arab–Arab conflicts". Glaspie also indicated to Saddam Hussein that the United States did not intend "to start an economic war against Iraq". These statements may have caused Saddam to believe he had received a diplomatic green light from the United States to invade Kuwait. This exchange only became public knowledge in 2011, following a WikiLeaks release of a cable, sent by the US embassy in Iraq, following on from Ms Glaspie's meeting with Saddam Hussein. In addition, one week before the invasion, the Assistant Secretary of State, John Kelly, told the US congress that the US had no treaty obligations to defend Kuwait. According to Richard E. Rubenstein, Glaspie was later asked by British journalists why she had said that, her response was "we didn't think he would go that far" meaning invade and annex the whole country. Although no follow-up question was asked, it can be inferred that what the U.S. government thought in July 1990 was that Saddam Hussein was only interested in pressuring Kuwait into debt forgiveness and to lower oil production. On 2 August 1990 at 2:00 am, local time, Iraq launched an invasion of Kuwait with four elite Iraqi Republican Guard divisions (1st Hammurabi Armoured Division, 2nd al-Medinah al-Munawera Armoured Division, 3rd Tawakalna ala-Allah Mechanized Infantry Division and 4th Nebuchadnezzar Motorized Infantry Division) and Iraqi Army special forces units equivalent to a full division. The main thrust was conducted by the commandos deployed by helicopters and boats to attack Kuwait City (see Battle of Dasman Palace), while the other divisions seized the airports and two airbases. In support of these units, the Iraqi Army deployed a squadron of Mil Mi-25 helicopter gunships, several units of Mi-8 and Mi-17 transport helicopters, as well as a squadron of Bell 412 helicopters. The foremost mission of the helicopter units was to transport and support Iraqi commandos into Kuwait City, and subsequently to support the advance of ground troops. The Iraqi Air Force (IQAF) had at least two squadrons of Sukhoi Su-22, one of Su-25, one of Mirage F1 and two of MiG-23 fighter-bombers. The main task of the IQAF was to establish air superiority through limited air strikes against two main air bases of Kuwaiti Air Force, whose aircraft consisted mainly of Mirage F1s and Douglas (T)A-4KU Skyhawks. Meanwhile, certain targets in the capital of Kuwait City were bombed by Iraqi aircraft. Despite months of Iraqi sabre-rattling, Kuwait did not have its forces on alert and was caught unaware. The first indication of the Iraqi ground advance was from a radar-equipped aerostat that detected an Iraqi armour column moving south. Kuwaiti air, ground, and naval forces resisted, but were vastly outnumbered. In central Kuwait, the 35th Armoured Brigade deployed approximately a battalion of Chieftain tanks, BMPs, and an artillery battery against the Iraqis and fought delaying actions near Al Jahra (see Battle of the Bridges), west of Kuwait City. In the south, the 15th Armoured Brigade moved immediately to evacuate its forces to Saudi Arabia. Of the small Kuwaiti Navy, two missile boats were able to evade capture or destruction. Kuwait Air Force aircraft were scrambled, but approximately 20% were lost or captured. An air battle with the Iraqi helicopter airborne forces was fought over Kuwait City, inflicting heavy losses on the Iraqi elite troops, and a few combat sorties were flown against Iraqi ground forces. The remaining 80% were then evacuated to Saudi Arabia and Bahrain, some aircraft even taking off from the highways adjacent to the bases as the runways were overrun. While these aircraft were not used in support of the subsequent Gulf War, the "Free Kuwait Air Force" assisted Saudi Arabia in patrolling the southern border with Yemen, which was considered a threat by the Saudi Arabians because of Yemen–Iraq ties. A Kuwait M-84 tank during Operation Desert Shield in 1990. Kuwait continues to maintain strong relations with the coalition of the Gulf War. Iraqi troops attacked Dasman Palace, the Royal Residence, resulting in the Battle of Dasman Palace. The Kuwaiti Emiri Guard, supported by local police and Chieftain tanks and a Platoon of Saladin armoured cars managed to repel an airborne assault by Iraqi special forces, but the Palace fell after a landing by Iraqi marines (Dasman Palace is located on the coast). The Kuwaiti National Guard, as well as additional Emiri Guards arrived, but the palace remained occupied, and Republican Guard tanks rolled into Kuwait City after several hours of heavy fighting. The Emir of Kuwait, Jaber Al-Ahmad Al-Jaber Al-Sabah had already fled into the Saudi Arabian desert. His younger half brother, Sheikh Fahad Al-Ahmed Al-Jaber Al-Sabah, was shot and killed by invading Iraqi forces as he attempted to defend Dasman Palace after which his body was placed in front of a tank and run over, according to an Iraqi soldier who was present and deserted after the assault. Towards the end of the first day of the invasion, only pockets of resistance were left in the country. By 3 August, the last military units were desperately fighting delaying actions at choke points and other defensible positions throughout the country until out of ammunition or overrun by Iraqi forces. Ali al-Salem Air Base of the Kuwaiti Air Force was the only base still unoccupied on 3 August, and Kuwaiti aircraft flew resupply missions from Saudi Arabia throughout the day in an effort to mount a defense. However, by nightfall, Ali al-Salem Air Base had been overrun by Iraqi forces. From then on it was only a matter of time until all units of the Kuwaiti Military were forced to retreat or be overrun. Kuwaitis founded a local armed resistance movement following the Iraqi occupation of Kuwait. Most of the Kuwaitis who were arrested, tortured, and executed during the occupation were civilians. The Kuwaiti resistance's casualty rate far exceeded that of the coalition military forces and Western hostages. The resistance predominantly consisted of ordinary citizens who lacked any form of training and supervision. At first, Iraqi forces did not use violent tactics. Iraqi soldiers instructed Kuwaitis to replace their Kuwaiti license plates with Iraqi ones, and also set up an extensive system of security checkpoints to patrol the Kuwaiti population. Within a few weeks of the invasion, however, Kuwaitis began participating in mass actions of nonviolent resistance. People stayed home from work and school en masse. Kuwaitis also began printing informational pamphlets about the invasion from their home computers and printers and distributed the pamphlets to neighbors and friends. After that wave of nonviolent resistance, the Iraqi military turned to repression in order to maintain control over Kuwait. 400,000 Kuwaiti citizens left the country after the invasion, and a network of safe houses was established for those who remained and joined the resistance. Pamphlets with anti-war slogans were printed and the resistance provided hiding places and false identification cards for Kuwaitis who were sought by the Iraqi secret police. Resistance cells held secret meetings at mosques. Kuwaiti women like Asrar al-Qabandi, a prominent female resistance leader, staged street protests and carried signs with slogans like "Free Kuwait: Stop the Atrocities Now." Iraqi police searched the homes of those suspected of hiding foreigners or covertly smuggling money to the resistance movement. Money that was smuggled to the resistance was often used to bribe Iraqi soldiers to look the other way. Resistance tactics included car bombs and sniper attacks that caused mass Iraqi casualties. By August 1990, the resistance movement was receiving support from the U.S. government in the form of intelligence, materials, and other types of covert assistance. Both the CIA and the U.S. Green Berets were involved. The U.S. government, however, would neither confirm nor deny its support of the resistance on record. On the topic of the resistance, President Bush stated, "... in a broad way I support the Kuwaiti underground. I support anybody that can add a hand in restoring legitimacy there to Kuwait and to getting the Iraqis out of Kuwait." Operation Desert Storm, which included U.S. forces, also aided the resistance movement out of its base in Taif, Saudi Arabia. The Kuwaiti government went into exile in Taif and supported the resistance movement from there. The exiled Kuwaiti government explicitly supported the resistance and commented on its strategies. Although Iraqi forces curtailed almost all forms of communication within and outside the country, the resistance movement managed to smuggle satellite phones across the Saudi Arabian border in order establish a line of communication with the exiled Kuwaiti government in Taif, Saudi Arabia. Kuwaitis also printed informational pamphlets and distributed them to other citizens. This was especially important because the flow of information was severely restricted in Kuwait during the occupation; radio channels played transmissions from Baghdad and many Kuwaiti TV channels were shut down. A resistance newspaper titled Sumoud al-Sha'ab (Steadfastness of the People) was printed and circulated in secret. Informational pamphlets became one of the only sources of news from the outside world. Foreigners and Kuwaitis of different genders and classes participated in the resistance, breaking down Kuwait’s traditional social barriers. Ahmed ar-Rahmi, a lieutenant colonel in the Kuwaiti army, stated, "In Kuwait, everyone from children to old men resisted. There were no Kuwaiti puppets which Iraq could use to form a Government." In October 1990, Iraqi officials cracked down on the resistance by executing hundreds of people it suspected were involved in the movement as well as conducting raids and searches of individual households. After the crackdown, the resistance began to target Iraqi military bases in order to reduce retaliation against Kuwaiti civilians. In October 1990, the Iraqi government opened the borders of Kuwait and allowed anyone to exit. This resulted in an exodus of both Kuwaitis and foreigners, which weakened the resistance movement. Ground troop movements from 24–28 February 1991 during Operation Desert Storm. American tanks from the 3rd Armored Division during Operation Desert Storm. Another crackdown occurred in January and February 1991. Iraqi forces publicly executed suspected members of the Kuwaiti resistance. Kuwaitis were kidnapped, their corpses later deposited in front of their family homes. The bodies of executed Kuwaiti resistance members showed evidence of different kinds of torture, including beating, electrical shocking, and fingernail removal. Some 5,000 Palestinians living in Kuwait were arrested for their activities in support of the resistance, and Palestinian support was enough to cause Iraqi officials to threaten Palestinian leaders. Some Palestinians, however, supported Saddam’s regime because of sympathies with the Ba’ath party’s pugnacious anti-Israel stance. Palestinian members of the resistance sometimes disagreed with resistance tactics such as the boycott of government offices and commercial activity. The Kuwaiti resistance movement was suspicious of this Palestinian ambivalence, and in the weeks after Iraqi forces withdrew, the Kuwaiti government cracked down on Palestinians suspected of sympathizing with the Saddam regime. Iraqi forces also arrested over two thousand Kuwaitis suspected of helping the resistance and imprisoned them in Iraq. Many of those arrests were made during the Iraqi retreat from Kuwait in February 1991. Hundreds escaped from prisons in southern Iraq after the retreat and over one thousand were repatriated by the Iraqi government, but hundreds remain missing. The fate of 605 Kuwaitis arrested during the occupation remained unknown until 2009, when the remains of 236 of them were identified. Initially, Iraq claimed it had recorded the arrests of only 126 of the 605 missing Kuwaitis. The names of 369 other missing Kuwaitis are stored in files maintained by the International Committee of the Red Cross. Seven of those missing Kuwaitis are women and nearly 24 are under the age of 16. Iraq has made little effort to address the hundreds of missing Kuwaitis, despite trying to mend diplomatic relations with Kuwait in other ways. The resistance was a grassroots movement and leadership was organized horizontally, although Sheik Salem Sabah was cited as the "nominal head of the resistance movement." Yahya F. Suwait, Kuwait’s housing minister, said in October 1990 that the resistance movement helped undermine the occupation’s legitimacy and dispel the idea that Iraq invaded in order to assist with a popular uprising against the Kuwaiti government. The movement also protected Americans, Brits, and other foreigners trapped in Kuwait during the occupation. Some have cited the resistance movement as part of the foundation for a more robust civil society in Kuwait after the occupation. At the Al Qurain Martyrs Museum, Kuwait remembers its citizens slain during the resistance to Iraqi occupation. The families of those martyrs received material benefits from the Kuwaiti government such as cars, homes, and funding for trips to Mecca for the hajj. Since most accounts of the liberation of Kuwait focus on U.S.-led coalition forces, part of Kuwait’s goal in memorializing the resistance is to emphasize Kuwaiti citizens’ role in liberating their own country. More than 600 Kuwaiti oil wells were set on fire by retreating Iraqi forces, causing massive environmental and economic damage to Kuwait. After the Iraqi victory, Saddam Hussein installed Alaa Hussein Ali as the Prime Minister of the "Provisional Government of Free Kuwait" and Ali Hassan al-Majid as the de facto governor of Kuwait. The exiled Kuwaiti royal family and other former government officials began an international campaign to persuade other countries to pressure Iraq to vacate Kuwait. The UN Security Council passed 12 resolutions demanding immediate withdrawal of Iraqi forces from Kuwait, but to no avail. Following the events of the Iraq–Kuwait war, about half of the Kuwaiti population, including 400,000 Kuwaitis and several thousand foreign nationals, fled the country. The Indian government evacuated over 170,000 overseas Indians by flying almost 488 flights over 59 days. During the 7-month occupation, the forces of Saddam Hussein looted Kuwait's vast wealth and there were also reports of violations of human rights. A 2005 study revealed that the Iraqi occupation had a long-term adverse impact on the health of the Kuwaiti populace. After Iraqi forces invaded and annexed Kuwait and Saddam Hussein deposed the Emir of Kuwait, Jaber Al-Sabah, he installed Ali Hassan al-Majid as the new governor of Kuwait. The Iraqi invasion and occupation of Kuwait was unanimously condemned by all major world powers. Even countries traditionally considered to be close Iraqi allies, such as France and India, called for immediate withdrawal of all Iraqi forces from Kuwait. Several countries, including the Soviet Union and China, placed arms embargoes on Iraq. NATO members were particularly critical of the Iraqi occupation of Kuwait and by late 1990, the United States had issued an ultimatum to Iraq to withdraw its forces from Kuwait by 15 January 1991 or face war. On 3 August 1990, the UN Security Council passed Resolution 660 condemning the Iraqi invasion of Kuwait and demanding that Iraq unconditionally withdraw all forces deployed in Kuwait. After a series of failed negotiations between major world powers and Iraq, the United States-led coalition forces launched a massive military assault on Iraq and Iraqi forces stationed in Kuwait in mid-January 1991. By 16 January, Allied aircraft were targeting several Iraqi military sites and the Iraqi Air Force was destroyed. Hostilities continued until late February and on 25 February, Kuwait was officially liberated from Iraq. On 15 March 1991, the Emir of Kuwait returned to the country after spending more than 8 months in exile. During the Iraqi occupation, about 1,000 Kuwaiti civilians were killed and more than 300,000 residents fled the country. In December 2002, Saddam Hussein apologized for the invasion shortly before being deposed in the 2003 invasion of Iraq. Two years later, the Palestinian leadership also apologized for its wartime support of Saddam. In 1990, Yemen's president, Ali Abdullah Saleh, a longtime ally of Saddam Hussein, backed Saddam Hussein's invasion of Kuwait. After Iraq lost the Gulf War, Yemenis were deported en masse from Kuwait by the restored government. The US military continue a strong presence adding 4,000 troops in February 2015 alone. There is also a very strong US civilian presence with an estimated 18,000 American children in Kuwait being taught by 625 US teachers. Airlift — A Bollywood film based on the Indian evacuation right after the invasion. ^ "1990: Iraq invades Kuwait". BBC On This Day. BBC. 2 August 1990. Retrieved 20 April 2010. ^ Johns, Dave (24 January 2006). "1990 The Invasion of Kuwait". Frontline/World. PBS. Retrieved 20 April 2010. ^ a b c "Kuwait Organization and Mission of the Forces". Country Studies. Library of Congress. January 1993. Retrieved 20 April 2010. ^ John Pike. "Iraqi Ground Forces Equipment". Retrieved 19 December 2014. ^ See the House of Lords case Kuwait Airways Corporation v Iraqi Airways Corporation  UKHL 19. ^ "IRAQ: NAVAL THREAT TO US FORCES". Retrieved 19 December 2014. ^ Gause, F. Gregory, III (2005). "The International Politics of the Gulf". In Louise Fawcett. International Relations of the Middle East. Oxford: The University Press. pp. 263–274. ISBN 0-19-926963-7. ^ a b c d Cooper, Tom; Sadik, Ahmad (6 August 2007). "Iraqi Invasion of Kuwait; 1990". Air Combat Information Group Journal. Archived from the original on 6 July 2013. Retrieved 27 October 2016. ^ "Iran reportedly fires on Kuwaiti island", Lakeland Ledger, 30 March 1988. ^ a b Stork, Joe; Lesch, Ann M. (1990). "Background to the Crisis: Why War?". Middle East Report. 167 (November–December): 11–18. JSTOR 3012998. ^ Hindy, Lily (25 January 2008). "Interrogator: Invasion surprised Saddam". The Boston Globe. Associated Press. Retrieved 17 April 2010. ^ "The University of Manitoba - The Manitoban - February 5, 2003 -". 2 May 2007. Archived from the original on 2 May 2007. Retrieved 28 September 2018. ^ a b Hayes, Thomas C. (3 September 1990). "Confrontation in the Gulf; The Oilfield Lying Below the Iraq-Kuwait Dispute". The New York Times. ^ Gregory, Derek (2004). The Colonial Present: Afghanistan, Palestine, Iraq. Malden, MA, USA: Blackwell Publishing Ltd. p. 156. ISBN 1-57718-090-9. ^ Ibrahim, Youssef M. (26 July 1990). "Iraq Said to Prevail in Oil Dispute With Kuwait and Arab Emirates". The New York Times. ^ a b Friedman, Thomas L. (17 December 1990). "Standoff in the Gulf; A Partial Pullout By Iraq is Feared as Deadline 'Ploy'". The New York Times. Retrieved 17 April 2010. ^ "Confrontation in the Gulf" Archived 4 August 2016 at the Wayback Machine, The New York Times, 25 September 1990. ^ "The Iraqi Invasion; In Two Arab Capitals, Gunfire and Fear, Victory and Cheers". The New York Times. Kuwait: Reuters. 3 August 1990. ^ Eyewitness, Col. Fred Hart 1 Archived 18 August 2009 at the Wayback Machine. Users.lighthouse.net. Retrieved on 12 June 2011. ^ "Iran, Israel and the Shi'ite Crescent" (PDF). S. Daniel Abraham Center for Strategic Dialogue. pp. 14–15. ^ "Saddam's Security Apparatus During the Invasion of Kuwait and the Kuwaiti Resistance". The Journal of Intelligence History. Winter 2003. pp. 74–75. ^ "Two ethnicities, three generations: Phonological variation and change in Kuwait" (PDF). Newcastle University. 2010. ^ a b "The Kuwaiti Resistance". Middle East Forum. March 1995. ^ Chicago Tribune. "Kuwaiti Resistance Showed Extraordinary Bravery, Cunning Men, Women, Children Who Stayed Behind Helped Foil Iraqi Occupation." The Baltimore Sun, 19 March 1991, http://articles.baltimoresun.com/1991-03-19/news/1991078147_1_kuwait-iraqi-occupation-malik. ^ a b c Tétreault, Mary Ann. "Kuwait: The morning after." Current History 91, no. 561 (1992): 6. ^ a b c d "Iraq and Occupied Kuwait." Human Rights Watch Report, Human Rights Watch, www.hrw.org/reports/1992/WR92/MEW1-02.htm. ^ a b Perry, Tony. "Kuwait Works to Preserve History of Its Resistance to Iraq." Los Angeles Times, 23 February 2003, http://articles.latimes.com/2003/feb/23/world/fg-martyrs23. ^ a b Hedges, Chris. "After The War: Kuwait; At Home Among the Enemy, Kuwaitis Learned to Survive." The New York Times, 5 March 1991, https://www.nytimes.com/1991/03/05/world/after-the-war-kuwait-at-home-among-the-enemy-kuwaitis-learned-to-survive.html. ^ Wheeler, Deborah. "New Media, Globalization and Kuwaiti National Identity." The Middle East Journal (2000): 432-444. ^ a b John M. Levins, "The Kuwaiti Resistance," Middle East Quarterly, accessed 30 April 2018, https://www.meforum.org/articles/other/the-kuwaiti-resistance. ^ Mattar, Philip. "The PLO and the Gulf Crisis." Middle East Journal 48, no. 1 (1994): 31-46. https://www.jstor.org/stable/4328660. ^ a b Koring, Paul. "The Missing Kuwaitis of Baghdad’s Gulag." The Globe and Mail, 23 December 2002, updated 17 April 2008, https://www.theglobeandmail.com/news/world/the-missing-kuwaitis-of-baghdads-gulag/article4142930/. ^ "Kuwaitis Mourn the Missing in Iraq." BBC News, 14 May 2009, http://news.bbc.co.uk/2/hi/middle_east/8048477.stm. ^ Augustus Richard Norton, "The Future of Civil Society in the Middle East," Middle East Journal 47.2 (1993): 205-216. ^ Damage Assessment – Kuwait Oil Archived 2 November 2013 at the Wayback Machine. Federation of American Scientists. ^ al-Marashi, Ibrahim (9 April 2003). The Significance of the "Death" of Ali Hassan al-Majid. James Martin Center for Nonproliferation Studies. ^ Iraq Archived 8 August 2016 at the Wayback Machine. GlobalSecurity.org. ^ Kuwait Britannica Archived 11 November 2013 at the Wayback Machine. Britannica.com (19 June 1961). Retrieved on 2011-06-12. ^ Rohan Venkataramakrishnan. "The Berlin airlift was remarkable, but the largest civilian evacuation in history is by India". Scroll.in. Retrieved 11 April 2015. ^ State of Kuwait Archived 20 May 2016 at the Wayback Machine. Atlapedia.com. Retrieved on 12 June 2011. ^ Public health impact of 1990 Iraq invasion of Kuwait Archived 14 December 2009 at the Wayback Machine. Medical News Today. 4 July 2005. ^ "CNS - The Significance of the "Death" of Ali Hassan al-Majid". 9 June 2003. Retrieved 28 September 2018. ^ a b "World Acts Against Iraqi Invasion of Kuwait." Archived 21 September 2016 at the Wayback Machine. GlobalSecurity.org. ^ Hirst, David; Tisdall, Simon (3 August 1990). "Superpowers unite on Iraq". The Guardian. London. ^ Fairhall, David; Walker, Martin (17 January 1991). "Allied planes bomb Iraq: Kuwait's liberation begun, says US". The Guardian. London. ^ Murphy, Kim (15 March 1991). "Emotional Emir Returns to Kuwait Royalty: He covers his face and stoops to kiss the ground. But not many citizens turn out to greet him". The Los Angeles Times. Kuwait City. Retrieved 17 April 2010. ^ Saddam Sends Apology to Kuwait for Invasion Archived 31 July 2013 at the Wayback Machine. People's Daily. 8 December 2002. ^ PLO apologises over Kuwait Archived 2 February 2007 at the Wayback Machine. 12 December 2004. ^ "Archived copy". Archived from the original on 30 April 2016. Retrieved 20 September 2016. CS1 maint: Archived copy as title (link) UPI.com. 15 February 2015. ^ "Archived copy". Archived from the original on 18 September 2016. Retrieved 20 September 2016. CS1 maint: Archived copy as title (link) [Arab Times Online]. September 2016. The 16th Arabian Gulf Cup (Arabic: كأس الخليج العربي‎) was held in Kuwait, between 26 December 2003 to 11 January 2004. All matches were played Al-Sadaqua Walsalam Stadium. Yemen made their debut in the Arabian Gulf Cup. Iraq continued to be banned from the tournament because of its invasion of Kuwait in 1990. The 1990 airlift of Indians from Kuwait was carried out from August 13, 1990 to October 20, 1990 after the Invasion of Kuwait. Air India helped evacuate 175,000 people by civil airliners. The operation was carried out before the Persian Gulf War in 1990 to evacuate Indian expatriates from Kuwait. Following this operation Air India, the flag carrier Indian airline entered the Guinness Book of World Records for the most people evacuated by a civil airliner. Mathunny Mathews, Harbajan Singh Vedi, Abey Varicad, V.K Warrier, Ali Hussain and few others based in Kuwait helped immensely in the evacuation efforts of fellow Indians. The 1990 oil price shock occurred in response to the Iraqi invasion of Kuwait on August 2, 1990, Saddam Hussein's second invasion of a fellow OPEC member. Lasting only nine months, the price spike was less extreme and of shorter duration than the previous oil crises of 1973–1974 and 1979–1980, but the spike still contributed to the recession of the early 1990s. Average monthly price of oil rose from $17 per barrel in July to $36 per barrel in October. As the U.S.-led coalition experienced military success against Iraqi forces, concerns about long-term supply shortages eased and prices began to fall. The Arab Cooperation Council (ACC) was founded in February 1989 by North Yemen, Iraq, Jordan, and Egypt. The ACC was created partly in response to the four countries being left out of the Gulf Cooperation Council (GCC), partly out of a desire to foster closer economic cooperation and integration among its members, and partly as an Egyptian step to rejoin mainstream Arab politics after years of ostracism following its peace treaty with Israel. The members of the ACC, unlike the GCC states, appeared uncomfortable with the grouping's exclusion of other Arab states; the ACC charter explicitly states that "Membership in the ACC shall be open to every Arab state wishing to join it." The short-lived organization held at least 17 formal meetings at the summit or ministerial level in 1989 alone, in addition to dozens of working-level sessions. This level of institutionalization was more extensive than most Arab subregional gatherings had exhibited. Somalia and Djibouti showed interest to join the ACC but were asked to wait until the ACC would be consolidated. However, the organization did not survive the crisis that followed Iraq's invasion of Kuwait on August 2, 1990. In part, this can be attributed to the four countries' lack of common geopolitical interests, the absence of a true shared identity (beyond common status as Arab states), and tensions between Egypt and Iraq. After the Iraqi invasion of Kuwait, Egypt in particular opposed Iraqi actions—actually joining the coalition that sent troops to Saudi Arabia and eventually liberated Kuwait. In retrospect, Egyptian President Hosni Mubarak said that the security aspects of the ACC were probably designed by Iraq to lure Cairo into backing Saddam Hussein's foray into Kuwait. Within weeks of the invasion of Kuwait, the ACC's Secretariat canceled upcoming organizational events and the grouping ceased to exist in anything but name. Egypt officially suspended its membership in the ACC in early 1994. The ACC's failure was no surprise to many observers. Arab political pundit Mohamed Hassanein Heikal wrote in his book Illusions of Triumph (1992) that "The four leaders of the Arab Cooperation Council came [from] different and contradictory worlds, with outlooks so varied that they seemed improbable partners." The Battle of Dasman Palace, also called the Battle of Dasman, was a battle between the Kuwaiti and Iraqi forces during the Iraqi invasion of Kuwait on August 2, 1990. The phrase "Brock for Broglio" is sometimes used in the sport of baseball to signify a trade that in hindsight, turns out to be an extremely lopsided transaction.The names in the phrase refer to Lou Brock and Ernie Broglio respectively, the centerpieces of a June 15, 1964, six-player deal: Brock, Jack Spring and Paul Toth were traded from the Chicago Cubs to the St. Louis Cardinals in exchange for Broglio, Bobby Shantz, and Doug Clemens.It was thought initially the Cubs had done better in the deal, as Broglio was coming off some impressive seasons while pitching for the Cardinals, while Brock had been considered a disappointment for the Cubs.Almost immediately the effects of the trade were felt, as Brock batted .348 for the Cardinals and led them to winning the 1964 World Series. Brock also helped the Cardinals to another World Series title in 1967, a pennant in 1968, and played successfully for St. Louis through 1979, amassing 3,023 hits and 938 stolen bases (at the time becoming baseball's all-time leader in stolen bases) en route to his Hall of Fame election in 1985. Meanwhile, Broglio went only 4-7 with a 4.04 ERA for the Cubs, and by 1966 was out of Major League Baseball. Broglio did not tell anyone at the time, but he was suffering from an injured elbow since the second half of the 1963 season, and in November 1964, had his ulnar nerve reset.This is sometimes referred to as the most lopsided trade in baseball history.The Emil Verban Society, an association of Cubs fans in the Washington, D.C. area, which includes national political leaders and journalists, occasionally recognizes bad decision-making with the "Brock-for-Broglio Judgment Award"—presented, for example, to Saddam Hussein for his invasion of Kuwait in 1990. Fayeq Mohammed Al-Ayadhi (Arabic: فائق محمد علي العياضي) (May 5, 1948– ? ), better known by his pen name Fayeq Abdul-Jaleel (Arabic: فائق عبدالجليل), was a prominent Kuwaiti poet, playwright and lyricist whose work was well known throughout the Arab world. He was captured by Iraqi forces during the invasion of Kuwait in 1990 and he was the best known of more than 600 Kuwaiti civilians who were held as prisoners of war by Saddam Hussein's government. He was never seen by his family or friends again until his remains were unearthed in the Iraqi desert in 2004. The timing and manner of his death is a matter of some enduring mystery. The Gulf War (August 1990 to February 1991) was a war against Iraq by a U.S.-led coalition, following Iraq's invasion of Kuwait. Iraq conflict (2003–present) (March 2003 to December 2011), a two-phase conflict comprising an initial invasion of Iraq led by US and UK forces and a longer, seven-year phase of occupation and fighting with insurgents. American-led intervention in Iraq (2014–present), a multi-national campaign beginning in June 2014 to rid Iraq of ISIL influence and deliver humanitarian aid to Iraqi minority religious and ethnic groups. The Kh-25/Kh-25M (Russian: Х-25; NATO:AS-10 'Karen') is a family of Soviet lightweight air-to-ground missiles with a modular range of guidance systems and a range of 10 km. The anti-radar variant (Kh-25MP) is known to NATO as the AS-12 'Kegler' and has a range up to 40 km. Designed by Zvezda-Strela, the Kh-25 is derived from the laser-guided version of their Kh-23 Grom (AS-7 'Kerry'). It has now been succeeded by the Kh-38 family, but the Kh-25 remains in widespread use. The Kuwait Governorate (Arabic: محافظة الكويت‎) was the 19th governorate of Iraq established in the aftermath of the invasion of Kuwait by Iraq in 1990. It was preceded by the brief puppet state of the Republic of Kuwait. The Kuwait Governorate consisted of most of the occupied Kuwaiti territory, with the exclusion of the northern areas which became the Saddamiyat al-Mitla' District. 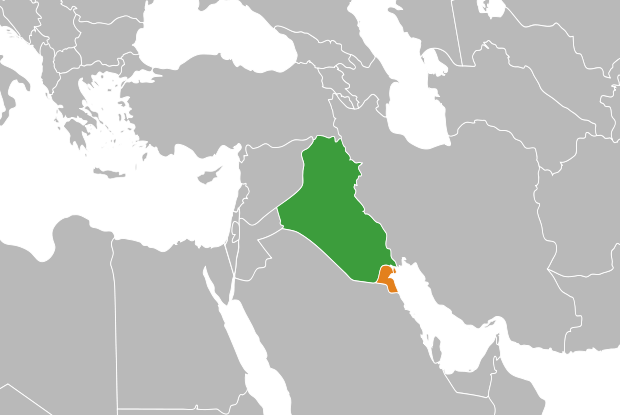 Iraq's refusal to withdraw from Kuwait led to the Gulf War and the eventual return of the pre-occupation Kuwaiti government on 28 February 1991. Kuwait–Saudi Arabia relations are the relations between the State of Kuwait and the Kingdom of Saudi Arabia. Both are members of the Gulf Cooperation Council. Historically there was a Saudi–Kuwaiti neutral zone inhabited by coastal fishermen; however, with the discovery of oil, the countries agreed to divide the territory, and reached an agreement in 1969.In 1990, following the Iraqi invasion of Kuwait, Saudi Arabia participated in the Gulf War to expel Iraqi forces from the country. Although Kuwait and Saudi Arabia are allies and cooperate within OPEC and the GCC, Riyadh disputes Kuwait's ownership of the Qaruh and Umm al Maradim islands. The Iraqi Republican Guard (Arabic: حرس العراق الجمهوري‎ Ḥaras al-ʿIrāq al-Jamhūrīy) was a branch of the Iraqi military from 1964 to 2003, primarily during the presidency of Saddam Hussein. It later became the Republican Guard Corps, and then the Republican Guard Forces Command (RGFC) with its expansion into two corps. The Republican Guard was disbanded in 2003, after the invasion of Iraq by a U.S.-led international coalition. The Republican Guard were the elite troops of the Iraqi army directly reporting to Saddam Hussein, unlike the paramilitary force Fedayeen Saddam, and the ordinary Iraqi Army. They were better trained, disciplined, equipped, and paid more than ordinary Iraqi soldiers, receiving bonuses, new cars, and subsidized housing. Scoundrel is a thriller book written by English author Bernard Cornwell. The story of the book is set in Europe, in 1990, just after the Iraqi invasion of Kuwait. It features Paul (Paulie) Shanahan, a Bostonian, who had moved to Europe in his role a member of the Provisional Irish Republican Army (PIRA). In his recent past, a woman, Roisin, had been caught by the Libyans, and found out as a Central Intelligence Agency (CIA) operative. Under the torture, and shortly before her execution, she had claimed Paul Shanhaan was also a sleeper member of the CIA. As such, all his terrorist contacts had shunned him, expecting him to return to the United States, as his cover was blown. As the story begins, he has been in the cold for three years, when he is contacted by an old Libyan contact, with a job for him. The job, on the face of it, is to sail a boat carrying five million dollars of Libyan gold, to Miami, to allow the PIRA to give it as payment to the Cubans, in exchange for fifty-two Stinger missiles. However, as the project pans out, Shannan becomes suspicious that the project is not what it seems. United Nations Security Council resolution 660, adopted on 2 August 1990, after noting its alarm of the invasion of Kuwait by Iraq, the Council condemned the invasion and demanded Iraq withdraw immediately and unconditionally to positions as they were on 1 August 1990. Yemen called upon Iraq and Kuwait to enter into immediate negotiations to resolve their differences, thanking the Arab League for its efforts. Talks between both sides broke down the day before in Jeddah, Saudi Arabia. The Council also decided to meet again as necessary to ensure compliance with the current resolution. The resolution was adopted by 14 votes to none, while Yemen did not participate in voting. It was the first of twelve resolutions on the conflict passed in 1990. United Nations Security Council resolution 665, adopted on 25 August 1990, after demanding the full and immediate implementation of resolutions 660, 661, 662 and 664, the Council authorised a naval blockade to enforce the embargo against Iraq, in the aftermath of its invasion of Kuwait on 2 August 1990. On 6 August 1990, after the Iraqi invasion of Kuwait, the Security Council adopted Resolution 661 (1990) which imposed economic sanctions on Iraq, providing for a full trade embargo, excluding medical supplies, food and other items of humanitarian necessity, these to be determined by the Security Council sanctions committee. After authorising the naval blockade, the Council invited Member States to co-operate with one another, and with the Military Staff Committee, to ensure compliance with the provisions of Resolution 661 (1990). It also requested the Secretary-General to report back to the Council on developments in the situation. Resolution 665 was adopted by 13 votes to none, with two abstentions from Cuba and Yemen. It avoided invoking the authority and purview of the Council under Article 42, Chapter VII, which would make the blockade legally enforceable. United Nations Security Council resolution 669, adopted unanimously on 24 September 1990, after recalling Resolution 661 (1990) and Article 50 of Chapter VII of the United Nations Charter, the Council was conscious of the increasing number of requests for assistance have been received under Article 50, relating to international sanctions against Iraq after its invasion of Kuwait. Article 50 states that if the Security Council is enforcing sanctions against any state, whether it be a Member of the United Nations or not, a country that is confronted with economic problems as a result of the measures has the right to consult the Council to find a solution to the problem. 21 states, including Jordan, which were experiencing adverse consequences of the sanctions, filed requests in this manner.In this regard, the Council requested the Security Council Committee established in Resolution 661 (1990) to examine requests for assistance under Article 50. It reported back by asking Member States to support other states that had been affected by the sanctions on Iraq. United Nations Security Council resolution 692, adopted on 20 May 1991, after recalling resolutions 674 (1990), 686 (1991) and 687 (1991), as well as taking the report by the Secretary-General, the Council decided to establish the United Nations Compensation Commission to deal with compensation claims resulting from Iraq's invasion of Kuwait, which subsequently led to the Gulf War.The Council also decided that the Governing Council of the Commission will be located in Geneva, would work to implement relevant parts of Resolution 687 (1991), and requested Member States to co-operate with it. It also asked the Governing Council to report as soon as possible on mechanisms for determining Iraq's contribution to the Commission, noting that if Iraq refuses to co-operate with the Governing Council, the Security Council may reconsider the prohibition against the import of oil originating in Iraq. Resolution 692 was adopted for 14 votes to none, with one abstention from Cuba. United Nations Security Council resolution 699, adopted unanimously on 17 June 1991, after recalling Resolution 687 (1991) and noting the report by the Secretary-General it requested, the Council, acting under Chapter VII, confirmed that the International Atomic Energy Agency and United Nations Special Commission have the authority to undertake weapons inspections in Iraq and to remove, destruct or render the weapons harmless. The Council requested the Secretary-General to submit a report on the progress of the implementation of the current resolution, and also asked Member States to provide full assistance so that the aforementioned activities are undertaken effectively. However, only US$2 million was contributed by Member States to the Commission, a small fraction of what was required. It also decided that the Government of Iraq should be liable for the costs of carrying out the inspections, due to its recent invasion of Kuwait. United Nations Security Council resolution 705, adopted unanimously on 15 August 1991, after considering a note by the Secretary-General, the Council decided that compensation paid by Iraq to the United Nations Compensation Commission arising from Resolution 687 (1991) should not exceed 30 per cent of the annual value of its exports of petroleum and petroleum products. The resolution, passed under Chapter VII of the United Nations Charter, allowed Iraq to export oil in return for humanitarian aid; however this resolution, along with Resolution 712, were both initially rejected by Iraq. Oil exports from Iraq were banned after its invasion of Kuwait on 2 August 1990.